This deal is In store only and there were approximately a dozen of them (in either black or white) marked down to this price. The reviews that I have seen are good especially considering the price. Amazon have them for £24and the RRP is £50. ★★★★★ Overall rating value is 4.1 of 5 stars. Enhance your sound experience with the Philips SHB400 overhead headphones, now with the benefit of wireless freedom. Enjoy a more balanced, natural sound that truly immerses you in the music. Built with technology for echo and noise isolation, these headphones are sure to improve on the way you listen to music. 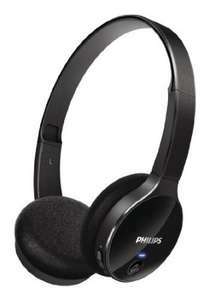 Bluetooth ready, the Philips SHB400 does not compromise on sound with its wireless capabilities. The device is as reliable as having a cable attachment. i got these instore at tesco couple of weeks ago and think they are a great set of headphones for music or media from phone or tablet really impressed definitely worth 12.50 ! Just picked this up from my local store for £11.25! They were priced on the shelf at £45.00 so make sure you ask at the till. Just picked this up from my local store for £11.25! They were priced on … Just picked this up from my local store for £11.25! They were priced on the shelf at £45.00 so make sure you ask at the till.Bargain! Thanks OP! 2 left at the Barhill superstore. Loads of these and others reduced at the St Helens store. Just bought 3 pairs of different models I don't even need. Still 6 pairs or so at Lee Mills, Plymouth as of 10pm 4/9/14. Also picked up the last pair of Sennheiser CX685 @ £12.50 and a pair of the PX685i for £15. Still some PX685is left, as well as some Sony MDR AS400iP @ £12.50. Was a bit of a pain to pair with my iPhone 5. The phone wasn't picking up the device. But when I held the power button down on the headphones, after several seconds it eventually appeared on the phone. Sounding and working great so far, heat added!